LED string lights 2Pcs(Total with 200LEDs 33FT)Dimmable Outdoor/Indoor Starry String Lights, Warm White Copper Lights with Remote Control for Garden Room Patio Party DIY any Decoration (Multi Color) by DALAMODA at Two Clock. Hurry! Limited time offer. Offer valid only while supplies last. 1.LED LIGHT COLOR. Warm white color makes the romantic, soft and warm atmosphere. 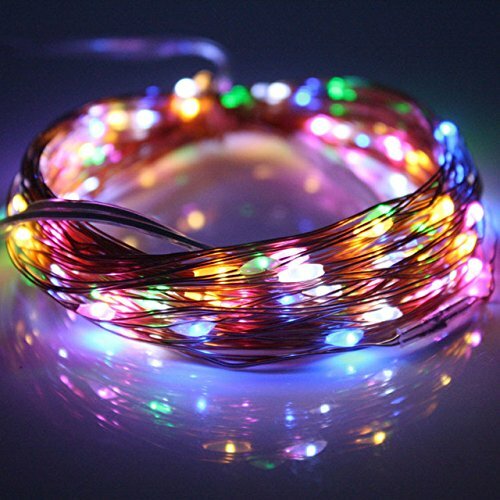 The LED is 360-degree sparkle with beautiful effect. BATTERY-OPERATED. Requires 3 AA Batteries (Not Included), so it is portable and can be mounted anywhere, Easy to hide and used at anywhere especially some places without power supply. Flexible and easy to bend. you could DIY the string light in your own creative way. If you have any questions about this product by DALAMODA, contact us by completing and submitting the form below. If you are looking for a specif part number, please include it with your message.